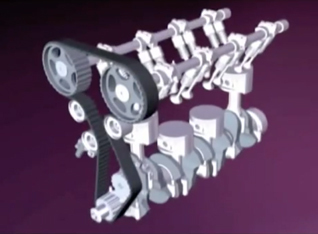 A cam belt is a part of an internal combustion engine that synchronizes the rotation of the crankshaft and the camshaft(s) so that the engine’s valves open and close at the proper times during each cylinder’s intake and exhaust strokes. In an interference engine like Alfa’s 16v Twin Spark and Busso V6s, the timing belt or chain is also critical to preventing the piston from striking the valves. Timing belts must be replaced at the manufacturer’s recommended kms and/or time periods. Failure to replace the belt can result in complete breakdown or catastrophic engine failure in cars such as the Alfetta GTV6, Alfa 75 V6, 147, 156, GTV 916 and GT. Timing belts commonly fail because they have stripped teeth (which leaves a smooth section of belt where the drive cog will slip) or suffered delamination and unraveling of the fiber cores. Complete breakage of the belt, because of the nature of the high tensile fibers, is relatively uncommon. The interval between timing belt replacement has on a number of occasions been revised from the intervals in Alfa Romeo owners manuals, talk to us if you are unsure. If your car is due for a new timing belt, call us to book an appointment – 9386 9650.